With less than three weeks to go we have a jam packed event planned with lots happening for the whole family to enjoy at our 2016 Teddy Bear’s Picnic! Your entrance fee to the picnic will include; access to the beautiful Cholmondeley Castle Gardens, our very special bear hunt, farm yard walks and play area. We will also be joined by Cheshire Fire and Rescue, Princess Elsa (who will be performing! ), Zoo 2 U (who will be bringing their owls and skunks) and have displays from Cheshire Gymnastics! There will also be a number of fun games and stalls for the children to have a go on from classics like Hook a Duck, Splat the Rat and Find the Magic Key to face painting, arts and crafts (including cup cake decorating!) and the all important bouncy castle! We will also have a Pimm’s Tent for the parents, which usually goes down perfectly with a picnic, and of course the Cholmondeley Tea Rooms will be open and serving a delicious selection of home made cakes, sandwiches, snacks and hot and cold drinks. Our sponsors Kumon, Rugby Tots and Cheshire Gymnastics will also be running activities on their stalls for children of all ages to have a go at! Gates to Cholmondeley Castle open at 11am and the picnic will wrap up at 5pm. We have a lovely spot set aside for picnics with the castle in the backdrop so bring your picnic rugs and hampers for a fabulous fun filled day! Tickets are now on sale and for all online adult tickets purchased you will receive a free child’s ticket. You can also buy tickets on the day, but discounts won’t apply and a larger proportion of ticket sales goes to The Wingate Centre children’s charity when you buy online! 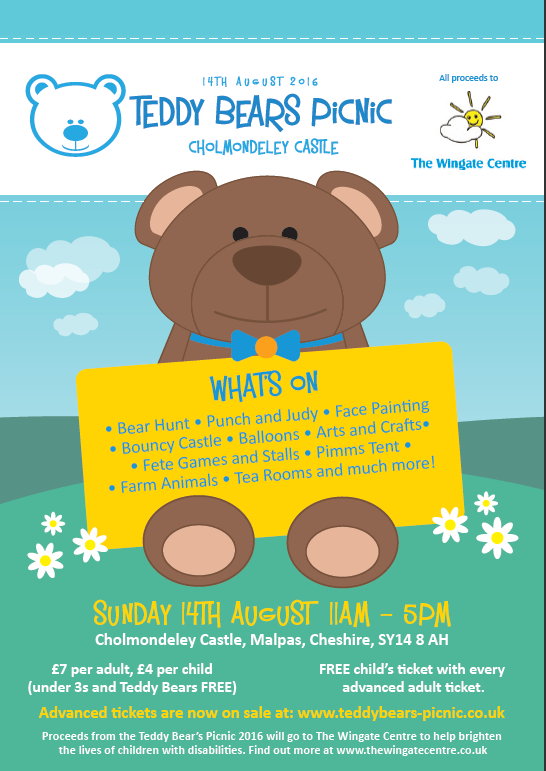 The Wingate Centre is delighted to be running this year’s Teddy Bear’s Picnic at Cholmondeley Castle! 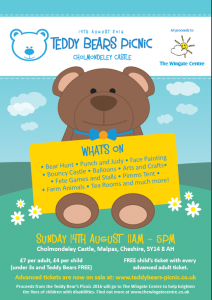 Bring your bears and a delicious picnic to join us for another great day out that all the family can enjoy in the beautiful setting of Cholmondeley Castle. Now in it’s 6th year there will be tonnes of activities including; a bear hunt, Punch and Judy, farm animal walk, bouncy castle, lots of games and stalls, arts and crafts, a Pimms tent (for the parents! ), tea rooms and much much more! Advance tickets are NOW ON SALE and we are offering a FREE child place with every adult ticket bought online! A BIG thanks to Crewe Alex who let Cholmondeley the Bear loose on the pitch earlier in the week! And thanks to all the Alex players and Gresty the Lion who signed a shirt for our raffle!